Today was pH day in AP Biology! So a million years ago I made this really simple worksheet/practice sheet for my AP Bio kids. Today the kids did awesomely! I would love to tell you that this is because of my amazing teaching ability... but it's about my classroom dynamics at this point. So the kids took notes last night (from a video I made at least 4 years ago), and they had questions about how to determine the pH, Hydrogen ion concentration, and hydroxide ion concentration. So we worked a couple of problems together. Some kids caught on quickly, and a few weren't there yet. So I took this opportunity to discuss proper ways to help peers. I reminded them that they have all had the same classes with the same teachers, most of them for a really long time. So sometimes it is more helpful to have a peer reword it for you because you speak the same language. 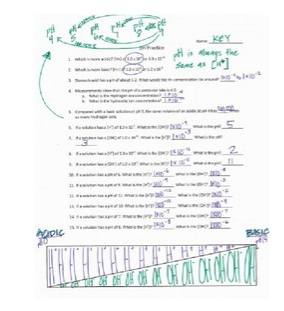 I have listed the worksheet and the key in our Teachers Pay Teachers Store: pH Practice. What do you do to help your kiddos understand pH? Please go to our website to know an excellent deal a good deal more about 250-430 dumps we have produced extensive investigation on many dumpsout.com braindumps selections and it is achievable to acquire out far a lot more on exam dumps plans. Auckland escorts Have a great day!